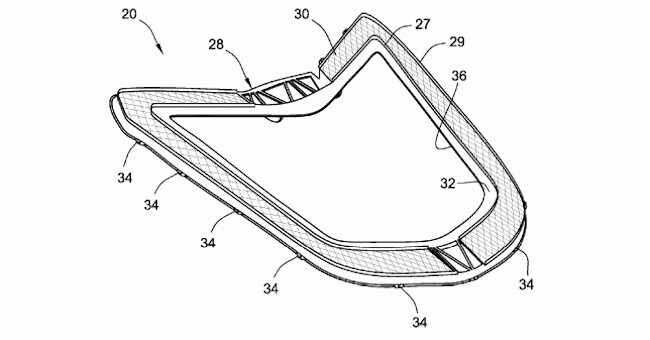 General Motors has filed a new patent application for a special ventilated rear engine compartment hatch, which is very likely for the new, mid-engine C8 Corvette. The rear engine compartment hatch comprises a glass cover surrounded by a mesh screen, which is supported by a raised metal frame. According to the filing, which was first discovered by Road & Track, the mesh portion of the engine cover could be made of magnesium in certain applications, helping to keep the hatch’s weight down. 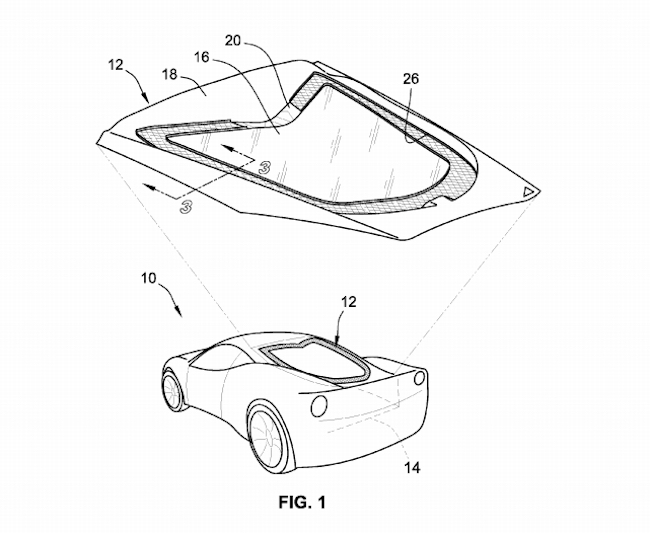 This unique design will allow Chevrolet to use a nice-looking glass engine cover on the mid-engine Corvette while also ensuring it receives proper cooling. The filing mentions this design could provide a 200 percent increase in airflow over a traditional engine cover design of this sort. With a forced induction engine likely to serve in at least one version of the mid-engine Corvette (if not all of them), cooling will be extremely important. Spy shots of the supercar show prototypes with extremely large rear side intake openings, which will work with the engine cover pictured in the patent here to provide cooling for the motor. The C8 mid-engine Corvette is expected to feature a dual-overhead cam V8 engine, which will likely be paired with some sort of paddle-shifted transmission. We’re hoping a manual transmission will be offered as well, but in this day and age of quick-shifting automatics, it’s hard to say. There are also rumors that multiple powertrains will be offered in the car, which may include an upgraded version of GM’s 6.2-liter LT1 V8 engine for the base model. We’ve also heard talk of a fancy hybrid all-wheel drive model, but let’s not get too crazy with the speculation – the vehicle’s debut isn’t too far off, after all. Chevrolet is expected to pull the wraps off of the C8 mid engine Corvette in Detroit next month, at which point all of our questions will hopefully be answered. The patent drawing looks sensible to my eyes. A variation of other manufactures rear hatch for mid-engined designs. No doubt it will have an unique engineering twist from GM. Form follows function!